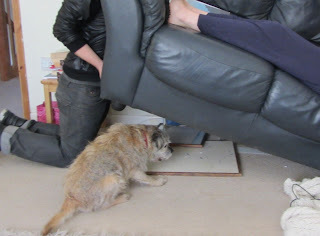 Harry Dog Blog: Harry's golf ball has gone under the sofa again. If Harry knocks his ball under the sofa then normally it can be got out with a stick - kept for that purpose. But on other occasions when the golf ball is unreachable,the sofa has to be lifted so Harry can get the ball.